Provides an interface to perform cluster analysis on a corpus of text. Interfaces to Quanteda to assemble text corpuses easily. Deviationalizes text vectors prior to clustering using technique described by Sherin (Sherin, B. . A computational study of commonsense science: An exploration in the automated analysis of clinical interview data. Journal of the Learning Sciences, 22(4), 600-638. Chicago. ). Uses cosine similarity as distance metric for two stage clustering process, involving Ward's algorithm hierarchical agglomerative clustering, and k-means clustering. Selects optimal number of clusters to maximize "variance explained" by clusters, adjusted by the number of clusters. Provides plotted output of clustering results as well as printed output. 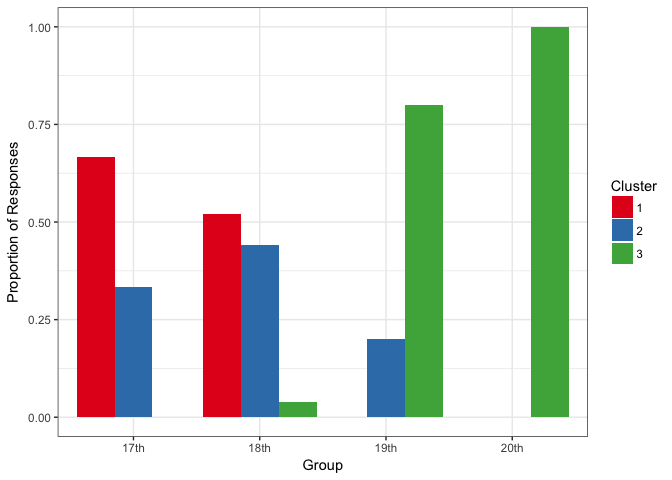 Assesses "model fit" of clustering solution to a set of preexisting groups in dataset. The goal of clustRcompaR is to make it easy to cluster (or group) a series of documents (texts of any length), and to interpret these groups and to describe their frequency across factors, such as between different groups or over time. This is a basic example using the built-in inaugural addressess dataset. First, we use cluster() to cluster the documents into three clusters. We include a new variable, year_before_1900, which we will later use to compare frequencies across clusters. Then we use extract_terms() to view the terms and term frequencies in the two clusters. #> Document-feature matrix of: 58 documents, 2,820 features (79.6% sparse). Second, we use the compare() function to compare the frequency of clusters across a factor, in this case, the century. We can then use the compare_plot() or compare_test() (which uses a Chi-Square test) function.